Door to Door Organics: Fresh Local Produce! Cost: Starting at $25.99 per box. Boxes ship weekly. You can skip or put your order on hold anytime for up to 6 weeks. 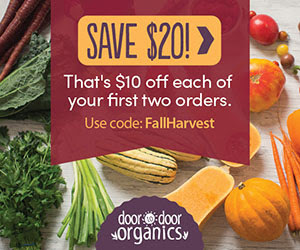 Coupon: Use code FALLHARVEST to save $10 off your first two produce boxes. What is Door to Door Organics? Door to Door Organics is an online grocery delivery service that partners with local farmers & artisans to deliver certified-organic fruits & vegetables, farm-fresh milk & dairy foods, humanely raised meat & chicken, sustainable fish & seafood & a curated natural, local groceries to your door every week. We deliver year-round & source organic & local foods whenever possible. This is a great way to eat clean and healthy. The only issue you might run into is that they might not deliver to your area. Currently Door to Door Organics ships to 80 cities throughout New Jersey, Pennsylvania, Delaware, Maryland, New York, Maryland, Ohio, Michigan, Indiana, Illinois, Iowa, Wisconsin, Missouri, Kansas, Colorado & Wyoming. The list is constantly being updated. To see if your area is there click here and enter your zip code. What do you think of Door to Door Organics? ← GlobeIn: October Artisan Box Full Spoilers!